If your child is obsessed with SpongeBob SquarePants like my son, than a costume might be just the thing. You could use it for Halloween or just for playing dress up around the house. This SpongeBob SquarePants costume from Wholesale Halloween Costumes is a simple slip over the head outfit and stick your arms through. It also came with shoe covers (not shown) but they were too big for my son. You certainly don’t have to add them in to have fun pretending to be SpongeBob! 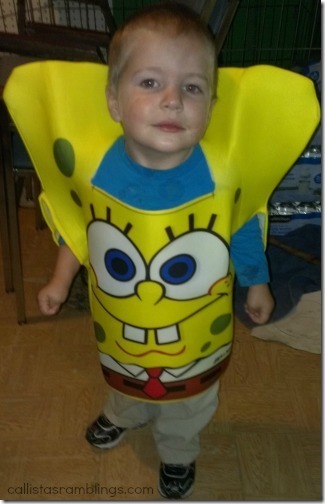 The one above being modelled by my two year old son is the Kid’s SpongeBob Costume and is available in sizes S-L. The costumes are on the small side so this is the Small (size 4-6) for my 2 year old and it’s still a tight squeeze. I’d recommended the small for ages 2-3. If your child gets the costume dirty (and let’s face it, it will happen,) than you will be happy to know that the costume is hand washable. It’s like a sponge material so you can easily wet and soap it and rinse it out and hang to dry. It should dry fairly quick. Wholesale Halloween Costumes also carries a deluxe SpongeBob costume and some other choices. Just search SpongeBob on the site. If SpongeBob isn’t your thing, there are TONS of costumes from babies to adults with ALL TYPES OF THEMES. The site ships pretty quickly, less than 10 days, often a lot less. They currently ship to United States, Canada, France, Australia, New Zealand and the United Kingdom.